I have a lot of recipes that require shredded chicken, so I thought I would share a tutorial on how to shred chicken breasts. First, you’ll want to have thawed chicken breasts. If they’re frozen, it will still work but it will take longer. Place the chicken in a boiling pot of water (with enough water to cover the chicken). Boil for 20 minutes until they’re no longer pink on the inside. Take the chicken out of the pot and place in a strainer to cool for a few minutes. Once it’s cool enough to touch, place one breast at a time on a cutting board and prepare to shred. Use one fork to hold the chicken in place, and another to tear the chicken (with the back of each fork facing the other). 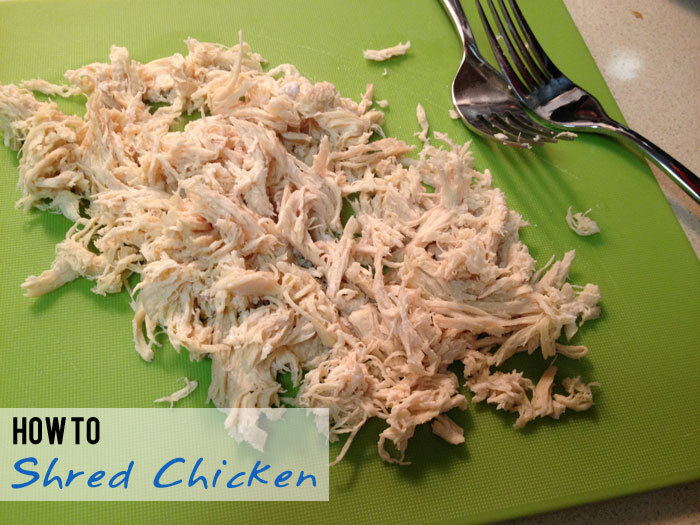 Pull the forks away from each other, and continue this process until you’ve shredded the whole chicken breast. Repeat for as many chicken breasts that you have, and use (or store in an air-tight container in the fridge) accordingly. Good luck!